Boston events October 2019. Things to do in Boston. A ticket to Connors Farm Corn Maze also includes hayrides, pedal carts, and activities in Danvers. The flashlight maze and haunted farm are only open Friday and Saturday nights, plus a few extra days. Salem Horror Fest invites you “to examine the themes of fear and the American experience within the horror genre” with films and special guests at Salem venues. Cambridge 5K - Oktoberfest begins at MIT with a German-themed race and ends with food and beer. The highlight of the The Taste of WGBH Food & Wine Festival is the Chef’s Gala featuring “cuisine from 21 award-winning chefs” plus wine and beer pairings at WGBH for age 21+. Sample 100 craft brews from 40 breweries at New Hampshire Brew Fest with food and music in tents at Cisco Brewers in Portsmouth, NH for age 21+. AppleFest offers a craft and farmer’s market, family entertainment, food, a 5K, and an Oktoberfest with beer garden and live music at Wachusett Mountain. Watch brass bands, vintage cars, military units, and politicians wind through the North End’s narrow streets in the Columbus Day Parade. Free. Enjoy four beer gardens, six stages of entertainment, 50 food vendors, 150 craft vendors, and roving bands that will get you dancing in the streets at Oktoberfest and Honk Parade in Harvard Square. See studios of 100 artists in historic waterfront warehouses during Fort Point Open Studios. Free. Repeats in May. Eat, drink, dance, and bid in an auction to support hunger relief during Party Under the Harvest Moon at Morss Hall on the M.I.T. campus. Boston Book Festival (BBF) celebrates literature and writing with dozens of author talks, seminars, writing workshops, exhibitors and publishers, live music, and kids’ entertainment in and near Copley Square on Saturday and Roxbury on Sunday. Free. Discover new food items, taste samples, meet producers, hear speakers, and shop at Boston Veg Food Fest at Reggie Lewis Athletic Center. Free. Massachusetts Independent Comics Expo (MICE) focuses on the art of making comics and has panels, workshops, and exhibitors at Lesley University. Free. Watch 9,000 athletes from around the world compete in the Head of the Charles Regatta (HOCR), and visit vendors at the finish line Rowing & Fitness Expo. Free. Wellfleet Oysterfest promises good food, live music, an arts and crafts fair, cooking demonstrations, races for adults and children, kids’ activities, and a shucking contest at Wellfleet on Cape Cod. Festival of the Dead is a series of events that explore death’s macabre customs, heretical histories, and strange rituals in Salem, led by psychic mediums, paranormal investigators, witches, and warlocks. Dance in the Grand Ballroom to pop, party, and goth; see a laser light show and costume contest; eat hors d’oeuvres, and visit the cash bar at Salem Witches’ Halloween Ball at the Hawthorne Hotel in Salem. See works from 40 galleries at the weekend Boston International Fine Art Show at the Cyclorama. Children age 12 and younger are free. Hard Rock Halloween Thriller features a DJ playing top 40, hip-hop, and house music at the Hard Rock Cafe near Faneuil Hall for age 21+. Visit various bars for drink specials. Costume optional. Great Pumpkin Festival features beer, grilled food, and costumes at Cambridge Brewing in Kendall Square. The 8 p.m. session is for age 21+. Watch films of terror for 12 hours at the Halloween Horror Marathon, beginning with live music and a costume contest at Coolidge Corner Theatre. Oktoberfest Blues & Brews draws crowds for fall beer, food trucks, scenery, winery tours, and live blues at Nashoba Valley Winery. Bring cash. Under 30 Summit is a pricey series of music, food, drink, networking, famous speaker, and public service events for young entrepreneurs and game-changers. Find places where children in costume get free candy. Boston Asian American Film Festival showcases the experiences of Asian Americans on film and supports Asian American filmmakers. GlobeDocs Film Festival is “focused on telling important stories, large and small.” Films are followed by discussions with journalists and film makers, except the short film series. Hear 40 groups compete at the A Cappella Competition at Faneuil Hall Marketplace. Free. Celebrate the founding of the United Nations at the $125 UN Day Luncheon, with lunch and a speech by Timothy Edgar, former national security and intelligence official, at the Union Club. Play a game of soccer while wearing a giant plastic bubble that allows you to bounce safely off other players and roll over during Charity Bubble Soccer at Lopresti Park in East Boston, adult size only. Watch the great thriller Psycho by Alfred Hitchcock on the big screen as the Boston Pops performs the eerie soundtrack at Boston Symphony Hall. Opening Our Doors has open galleries, art museum admission, art-making, live music, salsa dancing, storytelling, walking tours, and food trucks. Free. Local Craft Spirits Festival is a tasting of beer, cider, cocktails, and straight spirits, with live music and food for sale outdoors at 38 Sidney Street in Cambridge for age 21+. A ticket to Brunch Bar includes delicious food and beverages (craft beer, cider, cocktails) from 100 restaurants and producers, chef demonstrations, and live music at WGBH Studios for age 21+. The Artisan Taste features chef tastings, vintner & brewer tastings, cooking demonstrations, artisan vendors, and live music at WGBH Studios for age 21+. Bring your dog to family-friendly Barktober Fest for games, live music, dog trick demos, scavenger hunts, vendors, treats for dogs & kids, and a dog costume contest at Wright-Locke Farm in Winchester. Free. Taste wine, mead, beer, and cider at the Salem Harvest Fest with music indoors in Salem. Buy a wristband to attend concerts by 50 performing artists at The Town and the City Festival in downtown Lowell. Some venues are for age 21+. Visual art will be displayed in five galleries and museums. Cranberry Harvest Celebration has cooking shows, harvest demonstrations, paddleboat rides, craft and food vendors, kids’ activities, and music in Wareham. Dress warmly and head to Old Sturbridge Village for The Sleepy Hollow Experience, a ghoulish guided walk through the countryside featuring encounters with characters like the Headless Horseman. Food is sold before the show and during intermission. Dress for fallout in the audience when you attend GoreFest, which is part bloodbath, part musical, and all campy at ImprovBoston. Billed as a macabre and unsavory night of circus, live music, and gore, Cirque of the Dead includes aerial, acrobatic, and juggling acts plus burlesque at Oberon. A ticket to Ghost Ship Harbor includes three haunted experiences aboard a ship docked in Quincy. Their fourth offering is a “Paranormal VIP Experience.” Parking is $5. See schedule. Witch’s Woods has seven attractions, including a haunted hayride and a nightmare mansion, at Nashoba Valley Ski Area. See schedule. Factory of Terror includes cutting-edge special effects and actors in professional makeup. See schedule. Register your pet for the Halloween Pet Parade and costume contest at Faneuil Hall Marketplace, or just enjoy it as a spectator. Free. Fall Pumpkin Float features floating pumpkins, kids’ activities, and music at Boston Common Frog Pond. Bring a hollow pumpkin under 8 inches in diameter. Costumes are welcome. 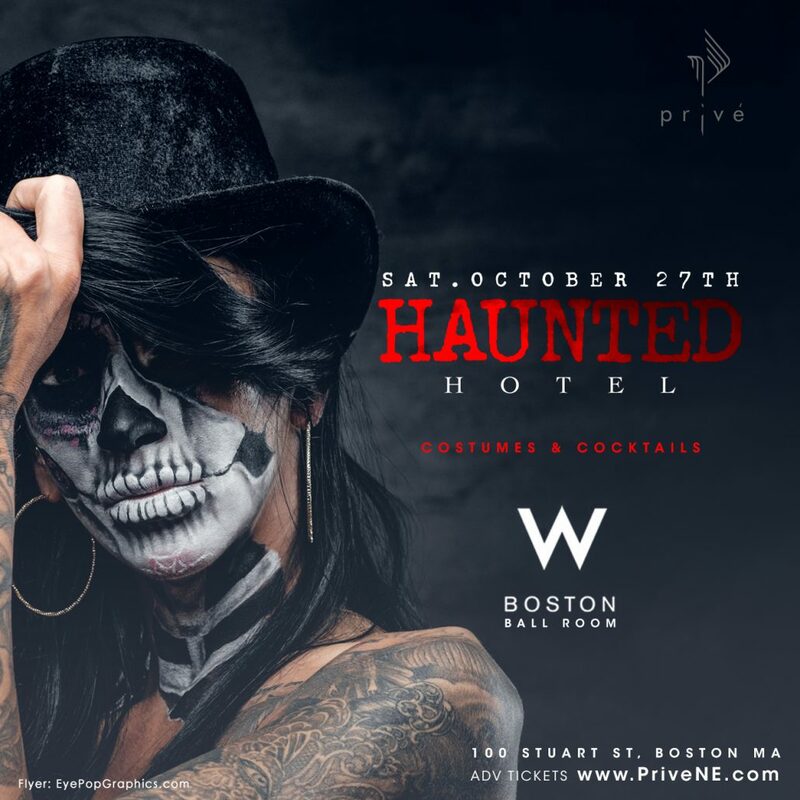 Haunted Hotel at W Boston is billed as the sexiest and funniest Halloween party in Boston, for age 21+. Halloween Lunch Cruise is a two-hour cruise aboard the Spirit of Boston with a lunch buffet, Halloween music, games, treats, cooking decorating, and a kids’ costume contest departing from World Trade Center. A ticket to family-friendly Howl-O-Ween Pawty includes human snacks, dog treats, a doggy costume parade, and a pet photo, with food for sale at Za Cambridge. Sinners & Saints Halloween Cruise is a costume party with DJ music and a cash bar on the Provincetown II, departing from 200 Seaport Boulevard. Zoo Howl features trick-or-treating, creepy crafts, ghoulish games, costume contests, a haunted maze, and pumpkins for animals at Franklin Park Zoo. Trick or Treat Halloween Costume Ball promises “New England’s Top DJs” with games, body art, and a costume contest at Garage Boston in Allston. Monster hunter Professor Abra Van Helsing hosts and narrates two tales of Gothic horror at The Van Helsing Chronicles, a radio-style show with on-stage voice acting and sound-effects performed live in Somerville. You’re welcome to wear a costume to A Spooky Science Carnival, where you’ll “learn the science behind some mind-blowing magic tricks and spooky effects while collecting candy” and playing carnival games at Metropolitan Waterworks Museum. Free. Boo at the Zoo features ghoulish games, creepy crafts, costume contests, a trick-or-treat trail, a haunted maze, and pumpkins for animals at Stone Zoo. An award-winning actor reads the timeless ghost story The Legend of Sleepy Hollow by Washington Irving in the atmospheric boiler house at Charles River Museum of Industry & Innovation in Waltham. Haunted Speakeasy features burlesque and variety acts, dancing to live music in the ballroom, Prohibition Era cocktails, and a 1920s costume contest at historic Bull Mansion in Worcester for age 18+. Watch red-hot molten iron fly through the air when industrial art is cast to live music at the Halloween Iron Pour at the Steel Yard in Providence, RI.